The Novotel Edinburgh Park is everything you'd expect from a four-star airport hotel - and then some. 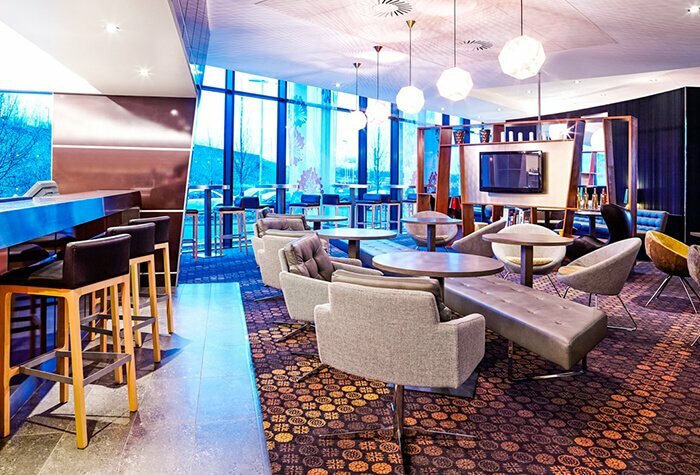 In spite of its ultramodern appearance, the hotel has a relaxed, family-friendly feel with something for everyone - there's play areas for the kids, free wifi for teens who want to keep connected and a buzzing bar for the adults to relax and unwind. 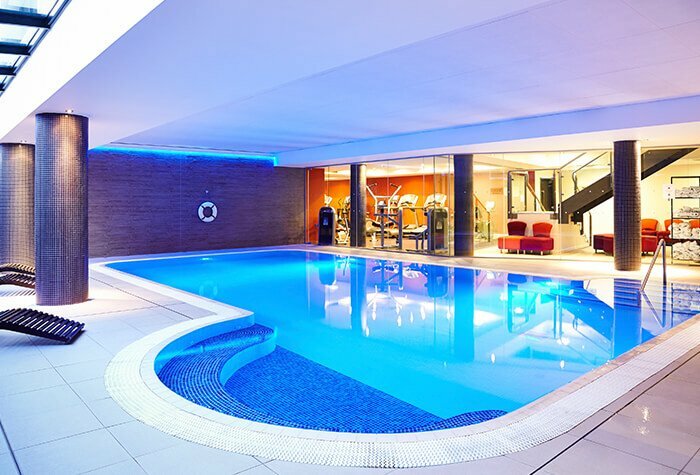 There's even an on-site gym and a huge swimming pool to take advantage of - the hotel really does have it all! The parking included with this hotel is at nearby Airparks - you'll need to park at the Novotel overnight before moving your car to the car park on the morning of your flight. From there, it's just 3 minutes to the terminal, and transfers are free. Of all the Edinburgh Airport Hotels we have on offer, we would highly recommend this for the tech-savvy traveller. Last minute booking due to flight change but everything was spot on! We left the car at the hotel for the duration of our holiday and stayed the night on our return. The reception staff were extremely helpful even though we arrived at 4am nothing was too much trouble, we would definitely stay again. The hotel is nice the room was nice, but the idea was to have a night's sleep before an early morning flight. Unfortunately this was not achievable due to the noise produced by the heating/cooling device. The noise it made was like trying to sleep next to a jet engine. On check out I mentioned this at reception only to be told that they were aware there is a problem on the second floor as they had been told about the noise by previous guests. So, I certainly could not recommend this hotel to any one who wished to be guaranteed a good nights sleep, another thing to be aware of is that the tram system runs alongside the hotel and trams are by no means silent. The holiday was very good and the facilities was on of the best we have stayed in. Further from the airport than we were lead to believe, Post code suspect, we ended up in retail park. Directions to airport a bit confusing as there are so many roundabouts, post code would have helped. Hotel fine, if a little over priced, but I suppose that's Edinburgh for you. 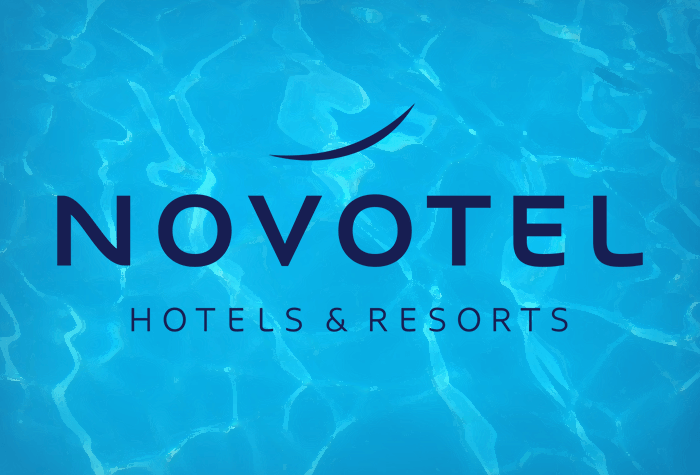 Our customers rated Novotel on average 9/10 (27 reviews). Read Novotel reviews. Cool, modern looks with welcoming atmosphere. Lovely big gym, steam room and pool. Families are well catered for. This incredibly stylish hotel is dedicated to filling your needs and every detail has been taken into account. 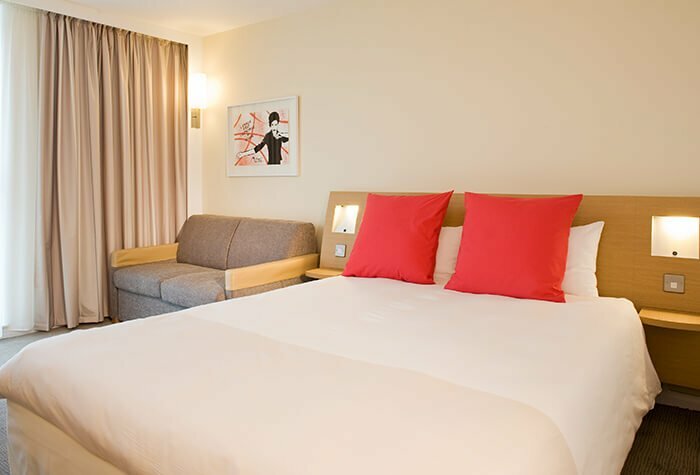 Within the modern decor, you'll find comfortable rooms and a trendy restaurant serving the best of French cuisine and hearty Scottish meals, not to mention a generous-size pool and kitted-out gym. The hotel is also perfect for families with free toys for kids and late check-out from family rooms. All this just a two-minute walk from Edinburgh Park train station and three miles from the airport. Check in from 14:00. Overnight parking at the hotel costs £4 for 24 hours and is free if you're parking for less than 2 hours. All of the hotel's spacious rooms are modern, but still homely, and have an en suite with both a bath and a shower. 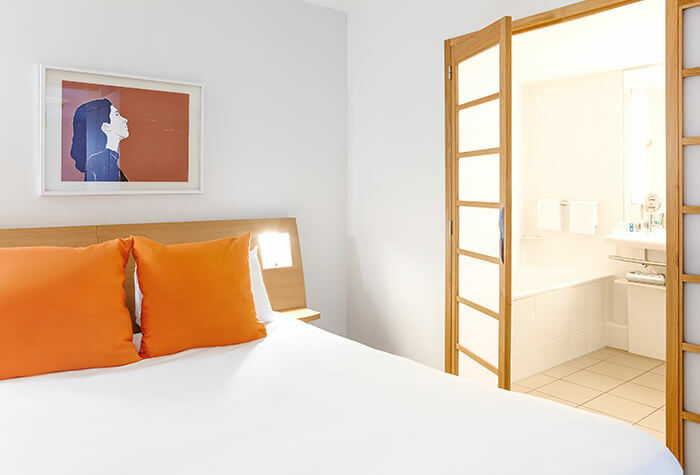 In the rooms, you'll find a phone, a 26-inch flatscreen TV, a hairdryer, a tea and coffee-making machine, an iron and ironing board, a desk and chair, a minibar, free wifi and a safe. 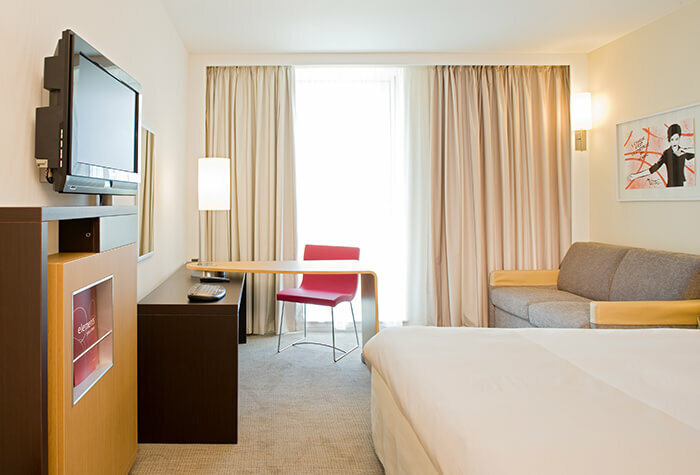 Double rooms have a pull-out sofa bed that is suitable for up to two children..
Once you've unpacked, you can take advantage of the hotel's swimming pool. Like everything else at the hotel, it's stylish and modern, but also bigger than you'd expect. Nearby, you'll find a gym that's packed with cardio equipment. Both the gym and the pool are open from 07:00 until 22:00. Make sure you find the time for dinner the hotel's retro Elements restaurant. It serves its own mix of Scottish and French dishes from 06:00 to 23:00 and you can order from room service if you arrive later. In the morning, have the Elements chefs cook you a hearty breakfast to set you on your way. It costs £13.95 and is available from 06:30 to 10:00, 07:00 to 11:00 on weekends. Getting to the airport couldn't be simpler. In the morning, have the hotel book you a taxi to the airport. It will take around 10 minutes to get there and cost about £12. Be one of our first customers to enjoy this luxury hotel. Disabled facilities The hotel has some rooms that have been adapted for disabled guests. If you need one of these rooms, call us on 0800 093 5478 and one of our team will contact the hotel to make the arrangements for you. In the morning, have the hotel book you a taxi to the airport. It will take around 10 minutes to get there and cost about £12. Drive to the hotel and park overnight. Youll find driving directions and a postcode for satnavs in your confirmation email. Overnight parking is £4. After youve checked out of the hotel its a 10-minute drive to Long Stay parking. Well give you directions in your confirmation email. When you arrive at the car park, just press the button at the barrier and you will be issued with a ticket. Then, just pull into any one of the available bays and park your car. Make a note of the nearest bus top. When you're ready to leave, just hop on the shuttle bus to the airport. It runs every 10 minutes and takes just 2 minutes to reach the terminal. When you return catch the bus back to the car park. On your way out of the car park insert your ticket and wait for the barrier to lift. Drive to the hotel and park overnight. Youll find driving directions and a postcode for satnavs in your confirmation email. After youve checked out of the hotel its a 15-minute drive to Secure Airparks. Well give you directions in your confirmation email. Once youve parked just catch the included shuttle bus to the terminal. It takes 2 minutes and runs continuously 24 hours a day. Transfers aren't needed, you just need to walk across the road to the terminal. After youve checked out of the hotel its a 10-minute drive to Valet parking. Well give you directions in your confirmation email. When you arrive at the car park unload your luggage and hand your keys over to the driver. While you walk across to the terminal your car will be parked for you. When you return walk back to Valet parking where your car will be waiting for you. If you return earlier or later than expected give them a call as soon as you can to let them know.